On the 3rd of August 2017, two brothers met with Archishop Desmond Tutu in Volmoed, an ecumenical retreat Centre in the Western Cape. He remembered his first visit to Taizé. “I visited Taizé in 1979, when I was Secretary General of the South African Council of Churches. I was deeply moved to find myself among five thousand young people from all corners of the globe, coming together across barriers of language and culture, finding their common humanity in seeking God, in shared prayer and song. Taizé is a place of welcome, of hospitality, of openness and trust. After reading a passage from Revelation during a prayer in the Church of Reconciliation, I had the idea to prepare a pilgrimage of young South Africans. It was impossible to organize the travel of 144,000 people but I organized a group of 144 young people of all races and churches, to prefigure the face of our country we were longing for. Soon, from a torn-apart and divided South Africa, young people of all races made the pilgrimage to Taizé and returned with new hope, new trust, having experienced a deepening and refreshing of their inner life. I was not permitted to leave the country with them as my passport was confiscated, but Bishop Bruce Evans accompanied them. 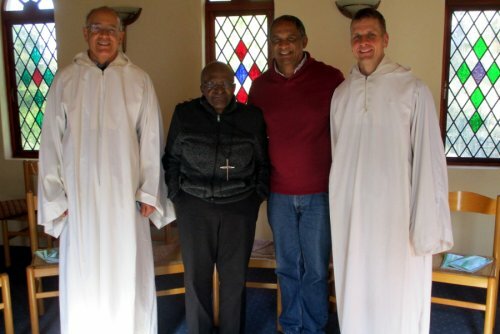 Archbishop Tutu and Reverend Edwin Arrison with br Luc and Norbert in Volmoed, August 2017. The words that Archbishop Tutu used to greet the participants of the 1995 Pilgrimage of Trust in Johannesburg are still relevant for today : ‘’Right now in our country, we desperately need to learn to listen to each other and foster trust between our diverse people. To build our nation, we need to strenghten our inner resources. Our new-found freedom brings with it many responsabilites – together we have to protect that freedom and build a peace-loving society which will benefit all its people. We cannot wait for someone else to make it happen. It is up to each of us to venture out in faith, to reach out a hand in reconciliation and build a bridge that nobody thought was possible. In prayer we find the energy to build, to set out. Prayer creates the climate in which we can meet and grow to love one another. Prayer is at the centre of all that happens in Taizé. The simple, distinctive style of the services, the symbols and songs have spread to many churches of all denominations, enriching the worship and encouraging us to explore the prayer of silence and meditation.